Louis van Gaal played a more aggressive wing-back pairing than against Mexico, with full-back Paul Verhaegh making way for winger Memphis Depay. Costa Rica manager Jorge Luis Pinto was without suspended centre-back Oscar Duarte, so Johnny Acosta came into the side. 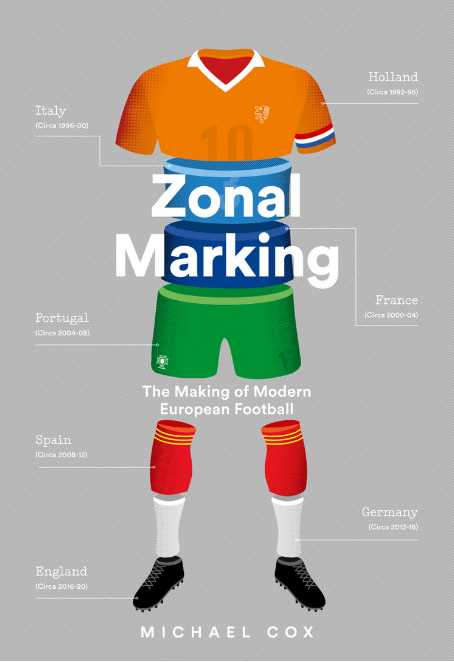 In a long, drawn out and – eventually – dramatic 120 minutes, the Dutch dominated but were disappointing in the final third. Before this match, both sides had generally played against teams happy to dominate the game, retain the ball, push up and leave space at the back. That played into the hands of these two, who used their pace on the break – the Dutch with direct balls to Arjen Robben, Costa Rica by pushing the wing-backs forward. With two counter-attacking sides, however, the game was more static. The best moments in the first half came when Costa Rica pushed men forward for set-pieces, and allowed the Dutch to break. The Dutch continued their approach of man-marking the opposition in midfield, where the battle was 2 v 2, rather than 3 v 3 as has been the case in their previous matches. At the back, the centre-backs always shut down Bryan Ruiz and/or Joel Campbell when they collected the ball in central positions, which often meant Daley Blind dropped deeper to become an extra centre-back, and Memphis Depay moved back from his wide position to become the wing-back. As always, the Netherlands don’t mind being drawn out of shape, as long as they have a spare man at the back. Costa Rica started with Campbell on the right and Ruiz upfront as a false nine, the reverse of what they’ve used in this tournament previously – although they switched midway through the first half when they weren’t creating much. They probably attempted the starting format because they knew how tight the Dutch man-mark – Ruiz was designed to bring them up, Campbell would sprint in behind. It didn’t create chances, but Bruno Martins Indi spent the game getting far too tight to his opponents, conceding fouls and eventually being booked. Proper formation battles at this tournament have been relatively rare, but this was an interesting example of both sides playing three at the back, but one manager changing his system higher up the pitch specifically for this challenge. The Dutch had completed a remarkable turnaround against Mexico in the previous round by playing three forwards stretched across the pitch, pushing back the opposition wing-backs, and he tried something similar from the start. The three Dutch forwards occupied the Costa Rican centre-backs to hamper their build-up play, but Costa Rica were scared of leaving 3 v 3 at the back, so the wing-backs dropped back and formed a five. They were rarely able to get forward on the counter-attack, so Costa Rica’s attacking play was poor – but they remained extremely secure at the back. The Dutch were on top with Costa Rica sitting back, but it was frustrating that Van Gaal was content to leave 3 v 1 at the back, with none of the three centre-backs stepping forward into midfield to force Costa Rica forward, creating space elsewhere. The three Dutch centre-backs spent much of the game playing passes to one another – in fact, they ended the 120 minutes as the three most prolific passers on the pitch. 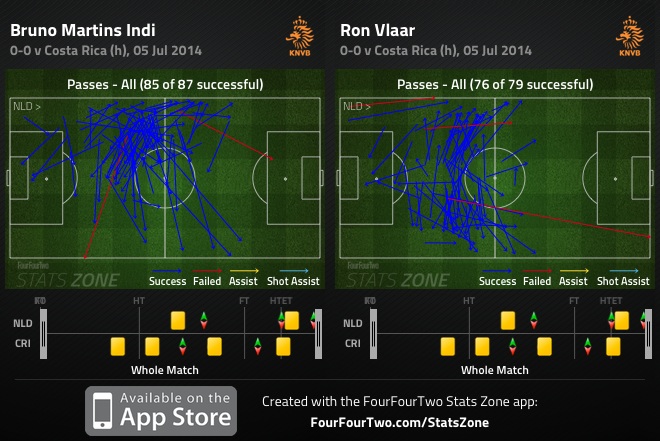 The distribution of Martins Indi and Ron Vlaar, in particular, was incredibly unambitious. Arjen Robben has spent this tournament finding space in the channels from a central starting position, but here it was the reverse – he was out wide and generally drifting into central, congested positions. Most problematically, he always had at least two Costa Rican opponents around him, usually showing him onto his right foot. Robben was happy to dribble past them, though, and got no fewer than three Costa Ricans booked – with Junior Diaz lucky not to be shown a second booking for another foul late on. Robben was the Netherlands’ most direct attacker, although the more the game went on, the more Wesley Sneijder came into the game. He hit the woodwork twice. The Dutch were also denied by another stunning goalkeeping display by Keylor Navas. The goalkeeping in the first couple of weeks of this World Cup was dreadful, but it’s been excellent in the knockout stages – which is one of the reasons we’ve had so few goals. 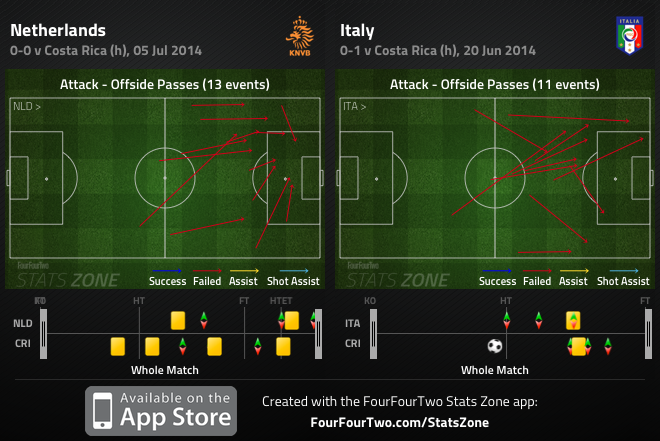 Another feature was the Costa Ricans’ well-drilled offside trap, which caught the Netherlands offside 13 times. This, coming after they caught Italy offside 11 times in the group stage, is a remarkable statistic. In fact, they caught the opposition offside 41 times in this competition. Compare that to the other seven quarter-finalists (Germany 17, Netherlands and Argentina 10, France 6, Brazil and Belgium 5, Colombia 4), and it’s clear the offside trap was extraordinarily successful, even with the minor caveat that Costa Rica played two periods of extra-time. There’s nothing too much to say about the trap, other than the fact the defenders worked excellently as a unit, stepping up extremely quickly. It’s difficult to remember an offside trap so successful since Jose Mourinho’s Porto side of 2004, who were similarly a defensive team, yet defended high up the pitch. Costa Rica needed to defend well, because after bringing on Marco Urena for Campbell, they completely lacked an out-ball – Urena didn’t offer pace in behind, or hold-up play, and the Dutch pressure kept coming. At half-time in extra-time, Van Gaal finally changed his formation, moving from a 3-4-3 to roughly a 4-2-4, with Martins Indi off, and Klaas-Jan Huntelaar on upfront. It felt like this change was a long time coming, considering the Dutch played with an unnecessary defender for so long – but they seemed completely destabilised defensively by the switch. Costa Rica had more chances in the final 15 minutes than in the previous hour – so perhaps the extra defender had been needed. This type of goalkeeper switch isn’t an entirely new idea, and makes perfect sense. The peculiar thing, though, is that Krul doesn’t have a particularly good record at saving penalties. He’s saved just 10% of penalties faced in the last five seasons, whereas the Netherlands’ other reserve goalkeeper, Michel Vorm, has saved 27%. It was clear, too, that Krul had a gameplan for the penalties. As the taker walked towards him, Krul always ventured out of his goal, generally walking to one side. Whether this had any significance or not is difficult to tell, but with the exception of the first penalty (when he didn’t walk to one side), the direction Krul walked was always the opposite direction to where he dived, and also to where the taker put the penalty. He dived the right way each time, saving two kicks, and putting the Dutch through to a semi-final. More formation tinkering from Van Gaal, although this time it wasn’t entirely successful. The Dutch dominated the game in terms of possession, but this was because they had too many players in defence, who passed the ball between them without being pressured, and without moving it quickly into midfield. The formation change late on seemed the logical attacking move, but it nearly backfired. Costa Rica have been a revelation at this tournament. From the 32 countries, they seemed to have the least chance of getting out of their group – not because they were a poor side, but because the opposition was so strong. Instead, they’ve reached the quarter-finals, were penalties away from the semi-finals, and end the tournament unbeaten. Their defensive organisation, combined with tactical flexibility, meant they caused bigger sides real problems, and regardless of what happens with the four sides still standing, Pinto should be regarded as the manager of the tournament. Keylor Navas, not Jesus! (that would be impressive). “The Dutch were also denied by another stunning goalkeeping display by Jesus Navas.” Can’t tell if you got confused cause of the Spanish winger or cause Keylor played like Jesus. The commentators made the same error more than once during the match. This was one of those matches where a cautious but clearly dominating side fails to penetrate a heroically defended bus in front of the goal. The fact that this match had three (or was it four?) Dutch shots on the post and crossbar, and that Costa Rica only managed a single shot on goal in two full hours of play speaks volumes. On nights like this (and we’ve seen lots of those, especially with club teams facing Barcelona and Bayern), the analysis afterwards will always tend to suggest the dominating side should’ve taken more risks and taken off more defenders, but playing against a well-organised and hugely motivated ultra-defensive team is extremely difficult for the best of sides, and double so if the first goal doesn’t fall quickly (forcing the opponent to leave the trenches). Taking a defender off for another striker would’ve made Costa Rica’s counterattacks more dangerous, and the space in front of CR’s goal even more crowded. The gameplan of Van Gaal this tournament seems to be to wear the opponent out in the first 60-70 minutes and then strike at the end. This was always going to be risky when that final winning goal doesn’t come. But Costa Rica were absolutely destroyed after 70 minutes, it’s an amazing feat they managed to hold out for another 50. Most of their midfielders couldn’t even control an easy pass anymore near the end, let alone do anything useful with it, but they still kept on marking and tackling and opening the offside trap. It deserves the highest praise – this was do-or-die, the stuff of legends. The obvious tactic against the bus is a Crouch and a winger with an accurate cross. Horses for courses; “Plan C” I call it. Carroll starts with C too. On t’other hand, who would bother to park the bus against England? And on another note: “and end the tournament unbeaten” – hats off. - you need to be able to deliver those crosses, and that’s not easy against a fast and alert 5-man defence. The main reason Holland got those endless corner kicks (11 was the stat, I think?) was that their crosses constantly got blocked. - you actually need to bring that big lad to the tournament. England didn’t select Crouch nor Carroll, and none of the other big teams seem to have such players, with the exception of the oft-criticised Klose in the German team. It may well be bringing Huntelaar on was delayed by the fact the third sub was going to be the ‘keeper. In that case the ‘keeper sub was even more ridiculous – using one sub and delaying another. As you pointed out the sub was made so late it actually came after the 120 minutes were up and what an omelette on van Gaal’s face that would’ve been. Just another example of someone happy to take credit for dumb luck. Personally, I hope they beat Argentina but fall to the Germans – then I’ll pretend I knew that would happen all along, like Louis van Gaal would. I would also call Kruls sub psychological. The strategy for his diving seems good on paper for the bad shots. I have always though that every goalie should have a strat for badly shot penalties. In Kruls case it is his reach advantage and this strategy works fine. I remember Taffarel using his quick reflexes and staying on his goal line, waiting until the end and trying to catch the bad shots. Myself I have been the penalty shooter for my team when I was playing in the local youth team and I always though that performing a good and strong shot will leave every goal keeper helpless. Totti, who I consider the best penalty shooter, is a player with similar philosophy, he shoots 90% of his penalties in the same place, but his power and accuracy is just deadly. I am so glad van Gall did this sub, so penalty shoot outs can be discussed. Overal, ZM, while I find your analyses very accurate and praising Costa Ricas manager very deserved too, I would not say that he is the manager of the tournament. According to me van Gal has done much more and outplayed Pinto in this game also. I find also that Costa Rica were very lucky (but deserving) to get here. However what I love about this team is that they had obvious strategies and knew how to use their potential, obviously a shout out to their manager. An aside, but I always thought it was odd when keepers claim that they have looked at a players past penalties and know where they will place it. Surely the player in question also has access to this data? Krul’s strategy was perfect in this sense: he would only go for the bad PK, because is much more likely that he’ll defend a misplaced PK than that he’ll guess the shooter’s idea and defend a good one. Actually, it’s almost impossible to save a well shot PK. If the accuracy is perfect, it doesn’t even have to be that strong; if it’s a powerful shot, it doesn’t need to be perfectly placed. If it’s powerful AND accurate, there isn’t a chance for the goalie. So, Krul must have thought: “there will be 2 or 3 PK that I won’t manage to save, so, I’ll stick to the other 2 or 3 that aren’t that accurate”. It’s a lesson to all goalies in the world – stick to the PK you can actually save, don’t try to do the spectacular (Krul’s saves weren’t spectacular at all). A penalty shootout should be a goalie’s dream, actually – he never has the blame if he loses and he’ll always be a hero if he wins, even if he doesn’t manage to touch the ball even once. Maybe that was Krul’s idea. As heroic as Krul’s antics were, one has to wonder why officials seem so reluctant to punish goal-keepers for infringements at penalties. That last Costa Rica penalty should have been re-taken because Krul had so clearly advanced when the penalty was taken. The funny thing is you have 2 officials with not much else to distract them and they simply refuse to do their job. It’s like the 6 second rule, no ref in the world will give that infraction against a goalie. The last one I remember was in 2007, and it was already surprising. It’s just one of those rules that, eventually, are not used, for any reason whatsoever. Most throw-ins these days are fouls too. I can’t remember the last time a foul throw was awarded. I ve read today in the media, that van Gals goal keeper trainer has suggested that sub and props to both for taking the risk. His assistant (whos name I obviously forgot and too lazy to check) has the following philosophy for goalkeepers. There are 2 types of goalies the A (anticipation) and R (reflex). The anticipation keeper is a goalie who is comfortable with the ball, good in play and can serve as 11th player in game. The R keeper is a strong, charismatic goalie with a long reach, who is a warrior and will do everything to make saves. Krul according to him is an R keeper, and they have developed a strategy for the penalties. Big shout out for the coaches giving attention to every little detail. Best game from the Netherlands so far, it was just one of those days the ball didnt want to get in the goal. Creating chances without giving anything away, that just shows how good van Gaal’s gameplan is, and how good the mainly mediocre players are employing it. 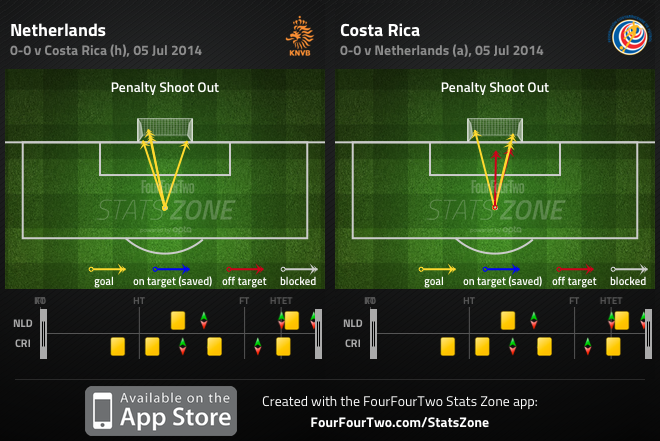 Pinto and Costa Rica surely deserve plenty of credit and the offside trap was impressive. Im personally liking me some Van Gaal after this tournament though. I liked the use of Kuyt on the right opposite of Blind on the left, very interesting stuff. I thought Kuty and Robben worked well as they were mirroring the 424 already. This was the first 343 of the tournament, no? All these changes because no Strootman and Van Der Vaart? Either a ballzy or dumb move but so far its has payed off. Is a 4-2-4 with Sneijder one of the 2 a good idea? It always seems likely to leave the defense vulnerable. Under norman circumstances 4 forwards + Sneijder is suicidal, but after 100 minutes when CR were already on their last legs, it seemed worth a shot. argentina showed they can defend when they want . sabella with studiantes de laplata stop barcelona in 2010 for 85 minute in fifa world clup final and i think sabella have defensive mind and his attacking plan is leo messi and they can beat netherland . strange all this credit for van gaal with the keeper switch. if you knew one keeper was better at pens, why wouldn’t u do it. but this begs a question when you are clearly the better side, why save a sub to do it? why not just win it in normal time or extra time, esp bearing in minds hollands poor record of pens and costa rica’s brilliant keeper . Because you don’t score goals by pushing a button. You might have noticed that they hit the woodwork three times. but you do score goal esp in this tournament by making subs. Huntelaar was only given 15 mins. as Pagliacci says above, the holding back of the 3rd sub probably delayed the 2nd sub too. KJH was in good form after a goal & assist in the previous game, & was fresh. others were tiring after the heat of the 2nd rd game. It didn’t make that much sense to throw an extra striker in, as that zone of the field was already extremely congested. If anything, it gave Costa Rica more space to break into. The obvious substitution was Huntelaar for Van Persie, but it was clear that Van Gaal wanted to keep him on for the penalty shootouts, even if RVP was exceptionally shoddy in his finishing. Luckily, you can’t be offside in a penalty shootout. Campbell didn’t looked right – probably injured – in the last two games. For me, this was the key. Had he provided the same threat as he did in his first two or three matches, the game wouldn’t have been so lopsided and Costa Rica could have won. But as it is, Costa Rica were left with only two really class players on the pitch, and one of them was their goalkeeper. Ruiz couldn’t do it by himself. In the end, they simply didn’t have enough quality. Thanks as always Michael, great write up. Only thing I wanted to add was how amazing it is that, in the quarter final of the World Cup [! ], one player could look so much better (in the most basic sense of the word) than every single other player on the pitch (Robben, obviously). It actually reminded me of some of my games as a 14/15 year old, when one player just stands out so much it turns into a game of get-the-ball-to-him-at-any-cost versus stop-him-any-way-possible. This highlights the point you have made elsewhere about this being the tournament of the individual. Costa Rica were happy to leave literally two or three Dutch players free just so they could group up on Robben, seemingly content in the knowledge that the other players probably wouldn’t hurt them anyway (and correct in that assumption!). 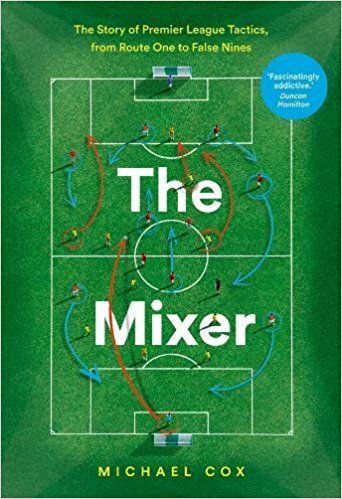 There seems to have been a regress in attacking players’ knowledge of what to do with space when it’s created for them by their superior teammates – see also the struggles of Hulk, Fred, the Argentina forwards, etc. does the fact that van gaal played for penalties prove a obvious weakness in the side? maybe he feels their not as creative enough? if argentina can get goals i think the dutch will struggle. robben wasnt really allowed room to run he was sent down the right hand side alot the only thing was he was winning a few free kicks on the right which argentina will have to think about. For me you cant dive in as he can turn you and when he feels the slightest of touches he’ll go down so you cant go lunging in. *Costa Rica* were playing for penalties (and got them). 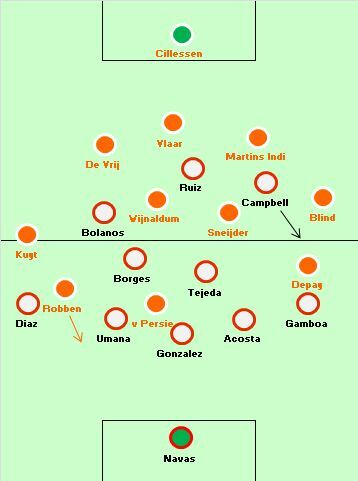 As for Van Gaal, the changes he made for the final 30 minutes resulted in 4 forwards, plus Kuyt (a striker), Wijnaldum (normally playing on “10″) and the ever-deep playing Sneijder in midfield – that was probably the most attacking formation this World Cup has seen yet. That’s hardly playing for penalties. Unfortunately, even playing with 7 forwards+CAMs is no guarantee for a goal.